Waiting for the bus in the rain is one of the distinct pleasures of living here. 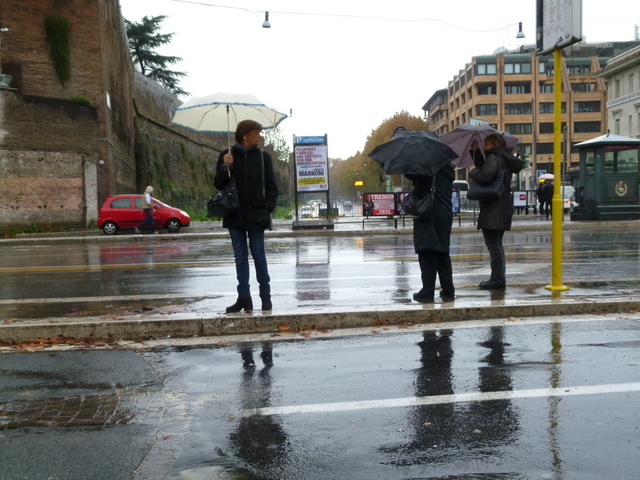 People bemoan the rain and what it does to their carefully laid plans, especially tourists with a limited schedule and vast lists of “must-dos” in Rome. True, this is a great city for being out-and-about, but the rain forces one to think of new indoor venues, especially when you’ve already seen the biggies: The Vatican, Villa Borghese, the Pantheon, Capitoline Museums, Palazzo Massimo (National Museum of Rome), San Luigi dei Francesi and countless other magnificent churches. There are many delightful and under-appreciated sites. 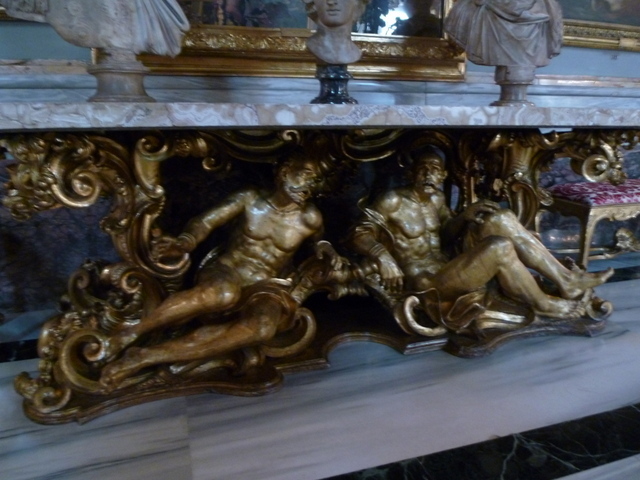 I wrote of one last summer, when we had Palazzo Braschi Museo di Roma almost to ourselves on a Sunday. I’ve sent many visitors there and received reports of how peaceful and interesting it was. This great hall was featured in the press conference scene of Roman Holiday with Gregory Peck and Audrey Hepburn. Usually our Saturday meanderings take us to Campo dei Fiori. This Saturday it was more like a bad day in Portland and not suitable to a 7km walk and marketing. So we ventured into another lesser-known but magnificent museum, Palazzo Colonna. I don’t know how many times I have passed by the rather unimposing edifice on via Nazionale, where the wax museum and various shops do not invite me to linger. But just around the corner, down a small alley-like street with several delightful marble bridges, is the entrance to perhaps the most impressive palazzo we have had the pleasure of visiting. As with many buildings here, the exterior is unremarkable but the interior is incredible. The property itself is gigantic, larger than the Vatican Museums, right in the middle of Rome, yet one can walk by daily, unaware of the treasures within. 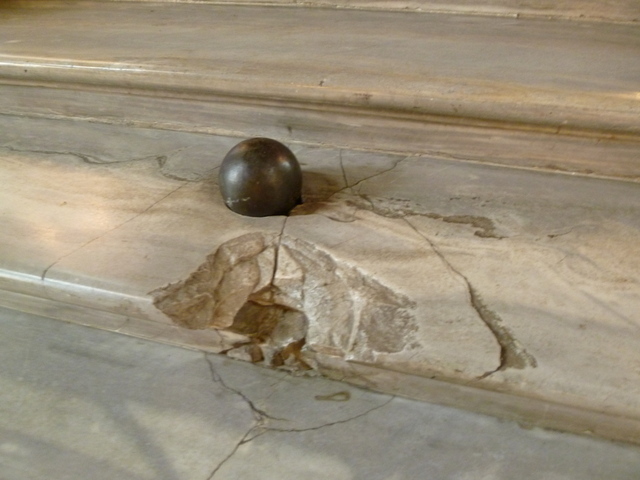 Embedded in the steps of the Great Hall, this cannon ball dates back to the Risorgimento. The family has lived here – yes they still occupy apartments – for eight centuries. Having never lived in one house for more than 8 ½ years, I am in awe of roots that run so deep. The building is as much art as the collection. Only open Saturday mornings, a visit includes a guided tour by an art historian, and the enthusiasm of the staff is itself a treat to behold. 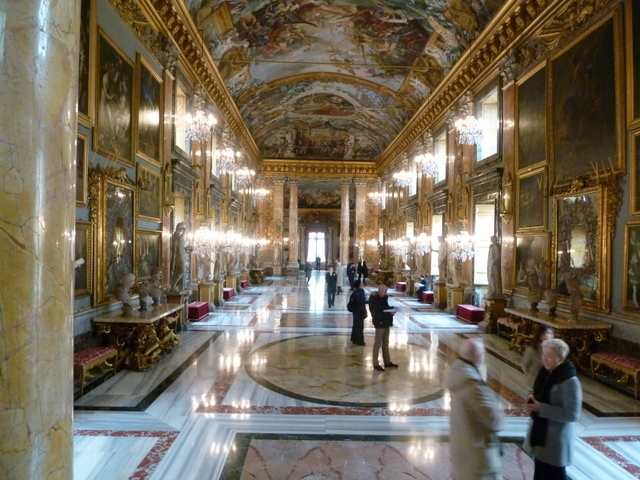 So if you find yourself in Rome on a rainy Saturday – or even on a sunny one – Palazzo Colonna should be on your list. 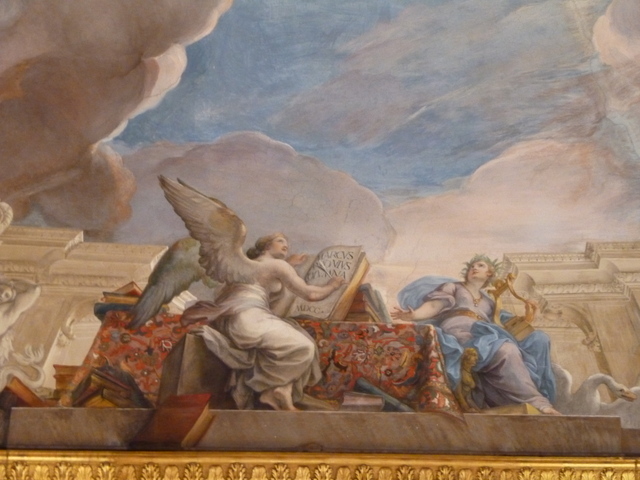 Magnificent frescoes and Tromp L’oiel cover the ceilings. A Colonna was responsible for defeating the Turks at Lepanto. This table base depicts captured Turks in chains. Nice find, I totally missed that one when I was there. Will have to add it to the list. You are so good at uncovering these unexpected treasures! I will be sure to visit these places on my next visit to Rome! Beautiful photos. Two new places for us to tour the next time we visit Rome.